Statistically Speaking: Is Drew Storen’s Rising Walk Rate A Concern? Even while ignoring the eye-popping walk percentage for this spring (six walks in a little under six innings pitched), we find Storen’s regular season walks to be creeping up as time passes. 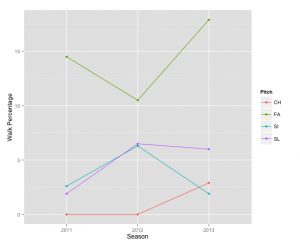 Adding in the spring training rates for contrast and we find some discouraging trends to pair with the regular season numbers. Storen’s changeup (CH) walk rate has gone up, which makes sense, given his increased use of the pitch; his bread-and-butter pitches—the sinker (SI) and slider (SL) show a drop in walk percentage last season as compared to previous years, which is encouraging. However, there is a troubling hike in Storen’s walk percentage with his fourseamer in 2013, which he used 23 percent of the time. 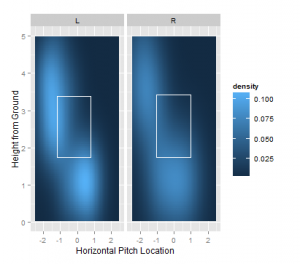 So it appears a potential bugaboo for Storen is locating his fastball and with McCatty’s quote, it makes sense that Storen is missing up with the heater. 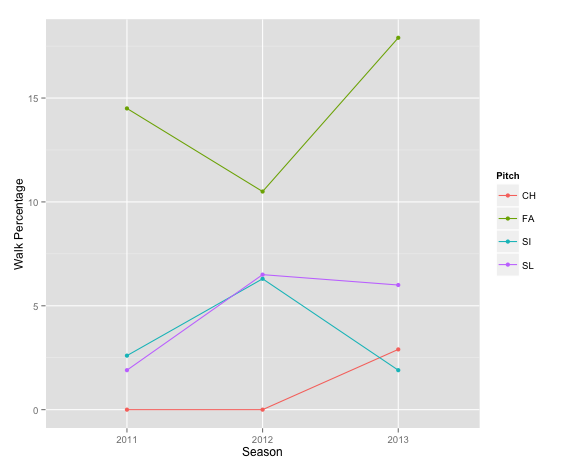 Sadly, we don’t have PITCHf/x data for any of Storen’s 2014 spring outings, but we do have plenty of said data from the 2013 regular season. Assuming that Storen isn’t working on a new pitch and is actually improved, having more time to recover from early 2013 season health issues, let’s take a look the PITCHf/x data for each of Storen’s pitches on called balls. 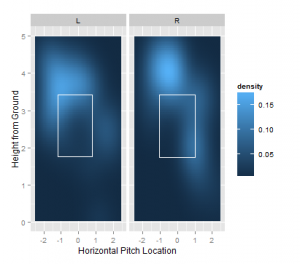 For the next four images, we are looking at a given pitch and a probability density map of the pitches that were called balls in reference to the strike zone. The lighter the color, the higher the probability a ball was actually called a ball. 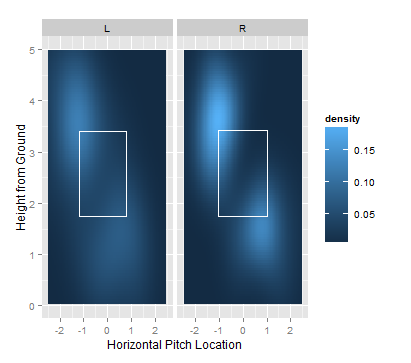 What’s interesting in these charts is the amount of light blue in the strike zone for each pitch, which are actual strikes that are being called balls. By the looks of it, Storen had a number of fastballs up in the zone called balls and a fair amount of changeups that were strikes incorrectly called balls. The trends are a little more egregious against right-handed batters, but is also seen to some extent against lefties. The point of all of this? 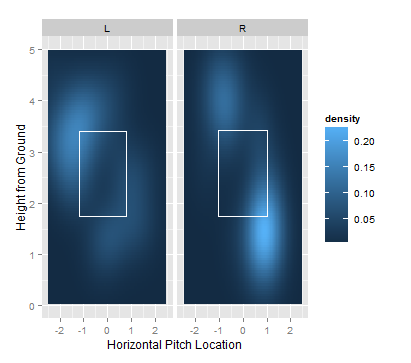 While you should never completely trust spring training numbers, some of the hike in walk rate seen from Storen might be more a result of strike zone interpretation more so than him losing command of his pitches. 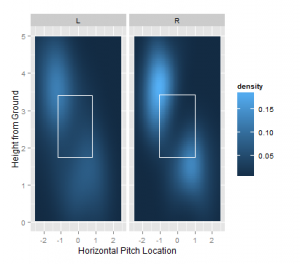 That being said, a careful eye should be kept on how well Storen commands his fastball up in the zone and his changeup down and out of the middle of the plate this coming season.